We’re in the 4th quarter now. It’s time to plan for the next year. When I left my full-time job in April, I still earned enough to cover our expenses for the rest of the year. Next year will be the first full calendar year in which we will be 100% part-time self-employed. As things stand now, and for the foreseeable future, we don’t expect the self-employment income to be able to cover our expenses. Spending more than we make is quite a change from living below our means. Unlike others who are able to cover their expenses by a pension, a spouse’s job, self-employment, or real estate rental, maybe supplemented by spending some dividends, we will actually start withdrawing from our investments. Many say managing portfolio withdrawals is much more difficult than saving for retirement. I disagree. It’s just different, something you are not used to, which requires some planning, a different setup, and some fine-tuning as you go along. Saving for retirement was also confusing for us in the beginning until we figured it out after some stumbles. Now we already have a lot more knowledge and years of experience in managing our money. Not everything is new. After thinking for some time about how we will do it, I came up with a plan. I’m sharing our setup here. It’s not going to be the best for everyone. Only we are going with it. As you will see, it’s not hard at all, and many parts are still familiar. We will continue maxing out all eligible retirement account contributions from our self-employment income. Because we don’t make much from self-employment, nearly 100% of that income will go into our solo 401k and Roth IRAs. To the extent we can, we will make Roth contributions because we will be in a lower tax bracket. These Roth contributions will help fund our retirement in the future. Because we have a choice between making traditional or Roth contributions, these contributions also become a lever we can use to make our taxable income higher or lower. If we want our AGI higher we will make Roth contributions. If we want it lower we will make some traditional contributions. For this reason we will delay making our IRA contributions to between January 1 and April 15 in the following year when we will have a better picture of our income tax situation, whereas we used to make the IRA contributions early in the current year. It’s possible to go ahead with contributing to Roth IRAs early in the year and then recharacterize as needed, but it’s too much hassle for too little gain for the amount involved. Retirement contributions will also possibly qualify us for the saver’s credit when our income is low enough to reach into its 10% tier (AGI $64,000 for married filing jointly in 2019). Coincidentally that number is very close to ACA’s 400% FPL number for a household of two in the lower 48 states. We will invest 100% of the retirement account contributions in bonds, for reasons that I will explain later in this post. Other than delaying the IRA contributions to the following year, this part isn’t much different than before. Maxing out all eligible retirement account contributions is still the modus operandi. We were doing backdoor Roth before. Now we will make direct Roth contributions. For those without employment income, this part can be replaced by Roth conversions to take advantage of lower tax brackets. We will have a conceptual spending account for paying bills. This can be a combination of a checking account plus a savings account or a checking account plus a money market fund. Before the year starts, we will fill this up with the anticipated spending in the upcoming year. Money for spending later in the year will go to the savings account or the money market fund, or very short-term, 3-month or 6-month, Treasury bills or CDs (see Treasury Bills vs CD vs Money Market). Interest and dividends from our taxable investments will also drop into the spending account. Any money left unspent at the end of the year will roll over to the following year. It will reduce the required fill-up for next year. Other than filling-up once a year versus twice a month from paychecks, the spending part also isn’t that different than before. As an alternative we can set up automatic withdrawals from our investments on a schedule once or twice a month to mimic the “paychecks” behavior. We choose not to do that because we think that’s too rigid for us. Filling up once a year should work just fine. “How much can you safely spend?” is a question with no precise answer, because we don’t know how the future will play out. We choose to follow the Variable Percentage Withdrawal (VPW) method collectively developed by a group of Bogleheads. We like the adaptable nature of this method. Every year you take a look at the total portfolio value and then you multiply it by a percentage you look up in a table based on your age and your asset allocation. That’s the amount you can spend this year. When your portfolio value is up, the amount you can spend goes up. When it’s down, you spend less. You don’t automatically ratchet up your spending by inflation every year. For instance a 40-year-old using an asset allocation of 70% stocks 30% bonds can spend 4.4% of the portfolio value next year. A 50-year-old using an asset allocation of 60% stocks 40% bonds can also spend 4.4% of the portfolio value next year. A 60-year-old using an asset allocation of 50% stocks 50% bonds can spend 4.5% of the portfolio value next year. The tradeoff of this method is that the amount you can spend will fluctuate with the portfolio value. It can go down in consecutive years. It can also stay down for many years when your portfolio value stays down. We’re completely OK with this fluctuation. It’s intuitive when the portfolio performs poorly you should cut back. You just make your budget fit under the calculated amount. It’s like Living Below Your Means all over again. Because we will spend the interest and dividends from our taxable investments, they count as part of the amount withdrawn. This part is new. Instead of putting money into taxable accounts we will pull money out of taxable accounts. We won’t take any money out of our retirement accounts. We won’t do any Roth conversion ladder (convert traditional to Roth, wait 5 years, withdraw from Roth) because we’d like to reserve the money in retirement accounts for years after 59-1/2. In my opinion if you have to touch the retirement accounts money before 59-1/2, you don’t have enough money saved. Our taxable investments will be in stock funds and Vanguard Short-Term Inflation-Protected Securities Index Fund (VTAPX, a short-term TIPS fund). Our existing CDs will go into the short-term TIPS fund when they mature. We will also redeem some low-rate I-bonds (0.0% – 0.3% fixed rate) and put the money into this fund. 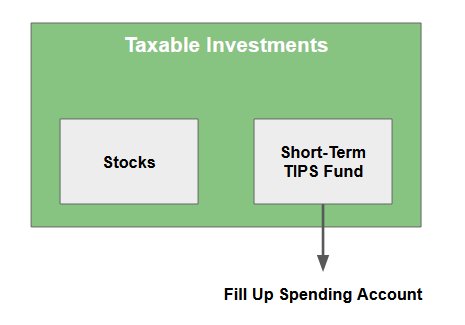 The short-term TIPS fund will be the source of the annual fill-up to the spending account. We choose to use a short-term TIPS fund because we’d like to have inflation protection and the lower risk of a short-term bond fund. A ladder of Treasury notes or CDs or a different short-term bond fund can also be a good option. We choose a bond fund over a Treasury or CD ladder because our spending can vary greatly from year to year based on the Variable Percentage Withdrawal method. A ladder would only deliver a fixed amount. Of course we can also use a ladder plus a bond fund — the ladder for the basic needs and the bond fund for discretionary spending — but we choose the simplicity of just a bond fund. I don’t think this choice makes a big difference. If you are more comfortable with the predictability of a ladder over a fluctuating bond fund, go for it. 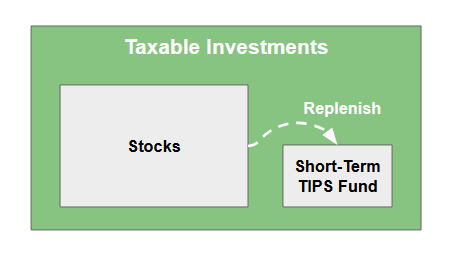 If you prefer a different bond fund over a short-term TIPS fund, that works too. The stock funds in our taxable accounts are for growth. Eventually the short-term TIPS fund will be nearly exhausted after some years of draining. At that time we will sell shares from the stock funds to refill the short-term TIPS fund. This setup can be described as a bucket strategy. Stock funds, a bond fund, and cash spending accounts form 3 buckets that cascade down. Although mathematically it can be shown that withdrawing only from bonds followed by rebalancing is equivalent to withdrawing proportionally from both stocks and bonds, withdrawing only from bonds in taxable accounts allows us to control the timing of realizing capital gains. If we withdraw proportionally from both stocks and bonds in the taxable accounts every year, we will have to realize capital gains every year. Because we don’t have a series of guaranteed payments earmarked by a ladder of instruments such as TIPS, Treasuries, CDs, or annuities, our approach belongs to the probability-based school as opposed to the safety-first school. We choose the conventional probability-based approach because we are comfortable with variance in the amount we can spend. We are not too concerned about having a level of spending guaranteed to us. Because we’re depleting bonds in our taxable accounts by the annual fill-ups to the spending account, we will invest 100% of our retirement account contributions in bonds to partially counter-balance it. Just doing that isn’t enough. Under normal market conditions, as bonds are drawn down more than the retirement accounts contributions, and as stocks grow, the percentage of stocks in our portfolio will go up. We will rebalance by selling stocks and buying bonds in the tax advantaged accounts. This rebalancing part also isn’t much different than before. Stocks don’t always go up. There will be stock market crashes. When that happens, we will sell stocks in the taxable accounts to buy bonds. Yes you read that right. Sell stocks when stocks are down. Selling stocks when they are down makes the realized capital gains lower. We will do the opposite in the retirement accounts: sell bonds to buy stocks. That will maintain our exposure to stocks. This is just rebalancing. Other than the accelerated replenishment of the short-term TIPS fund, it’s also not that different than before. Continue maxing out all eligible retirement account contributions. Favor Roth over traditional. Fine-tune after the end of the year. Spend from cash. Fill up once a year by the Variable Percentage Withdrawal method. Count interest and dividends not reinvested as part of the withdrawal. Don’t touch retirement accounts before 59-1/2. Withdraw from bonds in taxable accounts. Replenish when low or when stocks crash. Thank you for this article and all your great posts. Recharacterizibg a conversion is no longer allowed but recharacterizing a straight contribution is still allowed. What I ususally do is when the new tax software comes out in December, I total things up and make my last minute decisions by about the 26th of December. Thank you for sharing your thoughts. 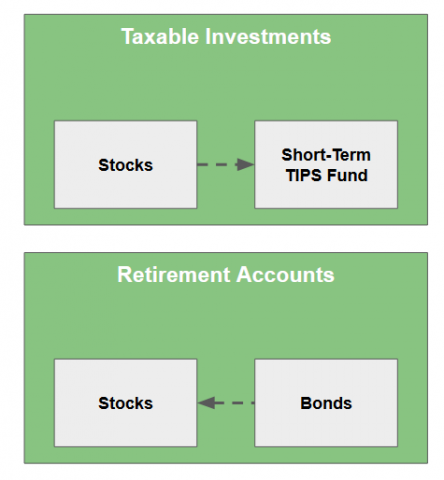 You mentioned when stocks go down, you will sell stocks to buy bonds in taxable accounts and do the opposite in retirement account. But what if after you do all that, in a few years stocks go down again? We won’t be able to use the same method again, will we? Sell stocks doesn’t mean sell all of them. If they go down again we will sell again. I too, like the VPW method as it seems much less rigid and follows common sense. So many of us in the “financial hobby” lean on our spreadsheets to come up with a rigid number, when in fact, life is much different. Thanks for the great article and wisdom on withdrawals. I want to research more about probability vs safety, but I think I’ll agree with you there, too. You will not be able to do so with Solo 401K, will you? I think perhaps profit sharing portion of it can be done after Jan 1st of next year (though I have mine at Fidelity and their contribution form does not have designation year on it, assuming current year always), but not employee contribution portion for sure. So what do you plan to do about it? 2) Also, what are yours/spouse ages, think you posted before but cannot recall? VPW method calls for using younger spouse age for withdrawals. Do you agree with it — or planning to average up ages instead? Can matter if gap is larger and I like VPW but wonder about this part of it. The $12,000 IRA contributions should be enough of a buffer for us. If we need more, we can use FinancialDave’s December 26 method and change our contribution elections at that time. The profit sharing part can be declared after the year ends. We are in our late 40’s. We happen to be of the same age. So we don’t have to wonder whether we should go with the younger age or the average age. I haven’t looked into that part closely. Of course going with the younger age is more conservative. 60 years old and just retired. Do you agree with my VPW approach that accounts for social security (SS)? The VPW authors have a “VPW Advanced” model that incorporates Social Security as a COLA’d pension. I didn’t look into it because Social Security is quite far ahead for us. Thank you for a nice blog! I am unclear how it will help to sell stocks when socks go down, and not just because it sounds counter-intuitive. Your goal would be to get a certain amount of cash out, while leaving the remaining amount of stocks intact. If you sell while stocks are still up, the tax bill may be (slightly) higher, but in the long run, will you not get higher returns from the higher remaining amount of stocks? Now, your approach might work favorably when the stocks go down by just a few percent and you sell to generate cash to keep a low tax impact. However, when the stocks go down a lot, by greater than a certain threshold percentage loss (10% 20% more?) and you sell to generate cash, you might lose too much of future growth. What would that threshold % be? I don’t know off-hand, but there might be a way to calculate that based on some assumptions about the portfolio size and cash to be drawn. Because we will buy stock funds in the retirement accounts at the same time as we sell (different funds to avoid wash sale if we are selling below our cost basis) we won’t lose future growth. The future growth is just transferred to the retirement accounts. If we sell as soon as the price reaches our cost basis, that would still be enough to get us to 59-1/2. A-ha! I see – That is a smart way! Great post. We are nearing retirement so this is top of mind. Are the interest & dividends the anticipated dividends for the coming year? Or are they the actuals for the current year that you’ve kept track of? The anticipated dividends and interest in the coming year. It can be estimated by the fund balance multiplied by a distribution yield. The actual dividends and interest received in the current year can also serve as a guide. Some brokerage accounts report these totals on the statements. Thanks for sharing this. I’m wondering about why you wouldn’t do Roth conversions, particularly if your income remains in a low bracket. If your traditional retirement account balances are high, you’ll likely pay tax in a higher bracket when RMDs kick in at age 70-1/2. Just because you convert Traditional to Roth doesn’t mean you have to withdraw it after five years. We can take another look in December 2019. Makes sense, thank you for the clarification. In short, you have to compare the 24.5% resulting tax rate against whatever bracket you’ll fall in when you make RMDs. That’s not exactly the correct way to look at it. A more exacting way to look at it is if you spend 24.5% on taxes for the conversion, in order to make that action at least a “wash” in retirement you need to spend that Roth money in at least the 24.5% tax bracket or higher. If you don’t need to or can’t spend the Roth money in a bracket higher than 24%, then you are wasting money doing the conversion. Of course we never know what bracket we are going to be in with “all” our retirement money, but I am just trying to put it in perspective. In many cases, especially if you retire early before SS, then you could be spending money out of your Traditional account in tax brackets all the way from zero to your upper marginal rate of your expense needs. Just think of all the tax money wasted if you converted too much of your money to a Roth and you can’t fill those lower tax brackets! 3) In short, without any income at all. In the case of someone with a pension and other income, whether earned or unearned, the lower brackets are already getting filled up, and a bigger problem looms in the way of RMDs. Just think of all the tax money you wasted when you withdraw RMDs because you didn’t use your lower bracket space to convert your TIRAs and T401(k)s to Roths! 1. Tax rates on income have been going down over the last 25-30 years at least. 2. Tax rates in retirement are lower (for the same “budget” or spending level) because you are not putting money away for saving and you aren’t paying SS & Medicare taxes. Obviously, if a pension and dividends covers all your spending needs, maybe the problem is you haven’t put the right assets in your taxable account to “allow” you to spend down your IRA account, or you haven’t put the correct assets in your IRA account, such as your bond allocation to allow it to grow slower. It is not necessary to put a lot of dividend paying assets in a taxable account if your real problem is too large of a Traditional IRA. Also, if you are single, I agree RMD’s are going to hit you a little harder, but still if you were always single for most of your life then your tax rate will still be lower in retirement. Hi. I guess I’m not understanding the exchange between FinancialDave and Joe. An advisor ran my #s and recommended I max out the 12% bracket with Roth conversions up until age 70, to reduce the projected tax (due to RMDs) on my social security (when I take it at age 70). I may be retiring soon at age 63 1/2. If i follow this recommendation I’ll be incurring higher up front tax bills for 7 years in order to pay less in tax over all, assuming i live to a ripe old age (I don’t know what age is the break even point). Is FinancialDave arguing against this strategy? Thanks. 1. Are you paying state tax on your income? In which case your tax rate probably won’t be 12%. 2. The other very large factor is the SIZE of your IRA funds. If you have a multi-milion dollar IRA at this point in your career, then I would certainly lean towards doing Roth conversions if you can keep your tax rate in the 12% bracket. 3. There are also many other things that all come into play, such as the size of a taxable account, which for someone in the 12% bracket in retirement has properties very much like a Roth account. Also the size of your expenses in retirement. 3. Let’s look at a more likely scenerio for most, which is a IRA of $1 million or less. 4. If you are in retirement at 63 and your expense needs are such that you are in the middle to lower end of the 12% bracket (allowing you some margin for conversions) then it is quite likely that when you reach age 70 you will still be firmly in that 12% bracket. Let’s just say that is true then the math suggests that there is absolutely no difference between spending money from your IRA @ 12% or spending tax-free money from your Roth which you have paid tax @ 12% already. So if this is the case your FA is wrong in saying you will have more money in retirement. There still may be some reasons to do some conversions but it will not “necessarily” give you more spendable income in retirement. What I am trying to get at is to make sure you understand it is NOT about how much tax you pay or when you pay it. It is about whether you have more spendable income in retirement. The math is such that if tax rates are the same for the money converted on the front end as they are when you spend the money in retirement, the total spendable income will be exactly the same no matter how much the money grows over 20 or 30 years in the IRA OR Roth. Harry, you might consider Ally’s current promotion to park $$$ for a few months. I haven’t seen something easy like this since BBVA Compass and Santander. Thank you TJ. I signed up for the no-penalty CD. $1,000 free is too good to pass up. I’m not sure I understand this opinion as a blanket statement as anything more than mental accounting. Whether you have enough saved isn’t a function of what an account is called by the IRS it is a function of the amount saved – for example, I have over six-figures in retirement account space every year so save very little in taxable savings (particularly when you throw in the other tax-advantaged saving for kids tuition, healthcare etc.) but it would be silly for me to not take advantage of the tax-management opportunity to avoid ‘touching’ retirement accounts in my early retirement years or pretending that a mid-seven figure portfolio isn’t enough saved because the IRS considers it a ‘retirement account’. Isn’t it just a way to effectively shift gains from taxable to retirement accounts over several market cycles? And (assuming the retirement accounts are traditional as opposed to Roth) wouldn’t it result in more ordinary income (and, eventually, more RMD) and less capital gains? How is this a better tax strategy? Of course, if retirement accounts in question are predominantly Roth, then it is a better strategy. I just happen to suspect that more people have lager traditional accounts and a comparatively smaller Roth space. Always great food for thought! What makes sense for us isn’t going to be the best for everyone. If we are not contributing our self-employment income to Roth accounts, we will use it for spending. We will need less from our portfolio and trigger less in capital gains. With more money being added to Roth accounts, we are able to buy stocks there when we sell stocks from taxable accounts. It’s like shifting future capital gains to the Roth accounts. Can someone point me to a discussion of this method? See reply to comment #1 from FinancialDave. On December 26 (or another day close enough to the end of year), I will have a very close estimate of our income. I can project our taxes with tax software or spreadsheet. If it’s too high even when we make our IRA contributions 100% traditional, I can increase the amount that I elect to contribute to the solo 401k as pre-tax, and decrease the amount as Roth. This will lower our income. The actual contribution will happen in the following year after I close the books but I need to elect the pre-tax/Roth mix before the end of the year, on a form I give to myself as the solo 401k sponsor/employer. OK, I understand now. Thank you for the quick follow up! Perhaps you were intentionally silent on this but I’ll ask anyway. Since you expect to have variable expenses, how are you sizing your near term buckets. That is, how much money are you putting into TIPs, especially since you aren’t sure what you are going to spend over the next few years. I’m not asking for your exact budget, of course, but if you did have predictable expenses, you might expect X% from self employment, Y% from investment income, and then have K years of (100-(X+Y)) per year in TIPs. I’m curious what K is. I’m also curious why you prefer VPW over something like a CAPE ratio based WR. Even the VPW guys seem to imply that it i only really useful for discretionary funds after your have accounted for your required expenses in some other fashion. I didn’t say much about the amount to be put in the TIPS fund because the amount is just a coincidence, not something deliberately planned. It’s basically everything except money already tied down — in stock funds with large unrealized gains, high fixed rate I Bonds not available any more if sold, etc. We happen to have some CDs maturing. When we bought the CDs five years ago we didn’t know we would need that money for withdrawals now. If we didn’t buy those CDs back then we would sell from whatever else we have. We are not targeting any specific amount in TIPS. I chose VPW because it’s directly connected to the portfolio value as a result of investment performance, whereas a CAPE ratio only indirectly links to performance. It’s possible to have a high CAPE ratio and good performance or a low CAPE ratio and poor performance. VPW can give a withdrawal number below the required expenses. That’s why they want you to account for required expenses in other ways. I don’t see any expenses as required. Whatever the VPW number is, we will fit our budget within it by whatever means necessary. Thanks for the article. One of my hobbies (which will hopefully pay off soon) is to study the various methods for determining the amount to withdraw each year in retirement. Like you, we are targeting an early retirement so stretching the funds over a longer time horizon is key. VPW is a great method for doing that plus the fact that it reflects annual portfolio performance. I’m also intrigued by the CAPE method where an individual can adjust the a & b parameters accordingly. However, pure CAPE does not account for bond performance unless another factor is added. Another easy method that I’ve been looking at is the RMD method. The IRS provides a table for annual RMD’s starting at age 70. I plotted these values into Excel and matched a trendline to get the overall equation. With the equation, I can now extrapolate to ages before 70 and come up with an annual withdrawal rate to our current age. As it worked out, at age 52 this withdrawal rate is 2.06% and goes up every year by ~3% due to shorter life expectancy. This w/r % is then multiplied by the portfolio value to give you the allowed spending amount for that year (just like VPW). Fritz at Retirement Manifesto wrote a good article on this RMD method. I need to spend more time on Excel and compare RMD vs. VPW. Fantastic stuff! Do bonds ever tank like stocks sometimes do? Say one is nearing retirement, say 2-3 years hence, and you know the s:b ratio you want in retirement, say 50s:50b , and you have been on a glide path to get there adding more bonds each year. “…We will have a conceptual spending account for paying bills. 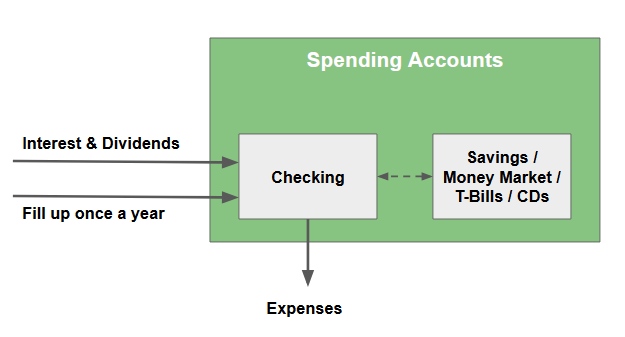 This can be a combination of a checking account plus a savings account or a checking account plus a money market fund. Before the year starts, we will fill this up with the anticipated spending in the upcoming year. ” …Our taxable investments will be in stock funds and Vanguard Short-Term Inflation-Protected Securities Index Fund (VTAPX, a short-term TIPS fund)…. The short-term TIPS fund will be the source of the annual fill-up to the spending account. Say you like having 3 years worth of expenses in cash, or instead of cash you like the VTAPX. “… Our taxable investments will be in stock funds and Vanguard Short-Term Inflation-Protected Securities Index Fund (VTAPX, a short-term TIPS fund). … The stock funds in our taxable accounts are for growth. Eventually the short-term TIPS fund will be nearly exhausted after some years of draining. At that time we will sell shares from the stock funds to refill the short-term TIPS fund. How conservative is this taxable account for you Harry? Say you are comfortable with an overall portfolio of ALL accounts of say 60s:40b; is this particular taxable account more conservative such as 30s:70b and others accounts hold a larger portion of stocks to achieve your OVERALL 60s:40b? Or, you really just go by the dollar amount for the # of years you want of bonds, say you your estimated expenses are $40K/year & you want 3 years or 5 years of VTAPX so that would be 40×3 or 40×5 in VTAPX & all the rest of the money in this taxable account is in your stock funds? Also how many years of VTAPX do you like, 3 years, 5 years, 10 years? Do I need to worry about “substantially identical”? We are talking index funds for the most part, and some of us have only 2-4 kinds (VTI, maybe a small cap value, 1 international, etc). You would have to buy a whole new asset class say an emerging market fund after you sold your S&P500 fund? Or a non issue because they are different accounts? They/IRS goes by account or individual? If by individual then a good case for having 2 separate taxable accounts individually in the 2 spouses names & 2 ROTHs for the 2 spouses? On the other hand hate to have a taxable accounts not held jointly for liability reasons? If anyone has any comments on my other 2 posts above, awesome.